Macdara Woods unquestionably possesses one of the most singular voices in Irish poetry. He has published eleven collections of poetry since 1970 with his Collected Poems appearing in 2012. 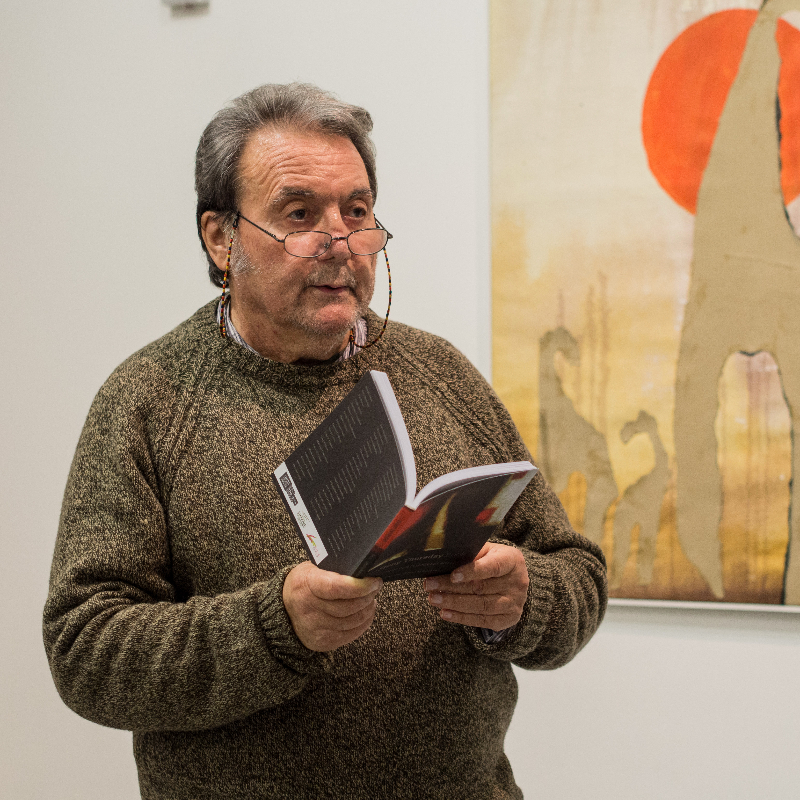 In addition he has published two collections in Italian and has poems translated in twelve languages. In 2002/3 he worked on two collaborative commissions: the first, In The Ranelagh Gardens, a sequence of twelve new poems to go with four new pieces from the Irish composer Benjamin Dwyer, first performed by both, in Dublin, in the Bank of Ireland Mainly Modern Series, February 2003. In July 2003 he completed the second, The Cello Suites, a six-part sequence of 480 lines, in response to a performance of the Bach Solo Suites by US double-bassist Richard Hartshorne at Verbal Arts Centre, Derry, in 2002. It was premiered by both in Harrisville, New Hampshire, December 2003, and performed again in Toronto, New York, and Dublin. He has read and lectured extensively throughout the world over the last fifty years, most recently in Brazil and Argentina. Perhaps Bernard O’Donoghue, in his Irish Times review (2001), put it best, “Macdara Woods has been an absorbing and relatively unplaceable presence in Irish writing since the 1970s, because the internationalising tendency of his poems to push the boundaries of Irish poetry outwards was always balanced by a rooted use of Irish language and tradition.” And push those boundaries he has, but in a careful measured way. While living mainly in Dublin, he also resides as much as he can in Umbria, where the poem featured below, Sons Are Older At The Speed Of Light, is located. The following day he had his hip replacement which required him to learn to walk all over again. It was more than a year after his initial surgery that Macdara was finally well enough “to get back to Umbria, a place I had begun to feel I was never going to see again, to start reassembling myself.” The poem was written last September after he managed to climb up to the top of the hill-town of Nocera Umbra. A slowing of the gait? Who ever died a winter yet? Macdara Woods was born in Dublin in 1942. Has been publishing work since the early sixties. He is a member, since 1986, of Aosdána, (set up by the Irish Government to honour those who have made an outstanding contribution to the Arts in Ireland). Recent reading tours include Austria, Russia, the United States, Canada, and Greece. His Collected Poems were published in 2012 by Dedalus Press and his pamphlet, From Sandymount to the Hill of Howth, was published by Quaternia Press in 2014. He currently lives in Dublin, and when he can in Umbria. He is the founder-editor of the magazine Cyphers (1975 to the present). He is married to poet Eiléan Ní Chuilleanáin, and they have a grown-up son, Niall, a musician. I guess we all feel that someone cooked the books along the way. What a powerful–and universal–poem. how can I describe this? I won’t even attempt it. To say great or wonderful would be lame. But this is definitely a significant work. I particularly understand and relate to that image of life being a slaughterhouse on wheels. And then the rhythm that immediately follows it, the energy of it. Fantastic poem. Thanks for posting this here, in this group. I forgot to mention that I read this on the Ox Mountain Poets facebook group. That is the group I was referring to. Anyway, an outstanding poem by Macdara Woods. Many thanks for another wonderful poem! Words woven into a khipu rope that starts making more and more sense as you slide along it. Time freezes. World becomes a place full of wonder. Again.